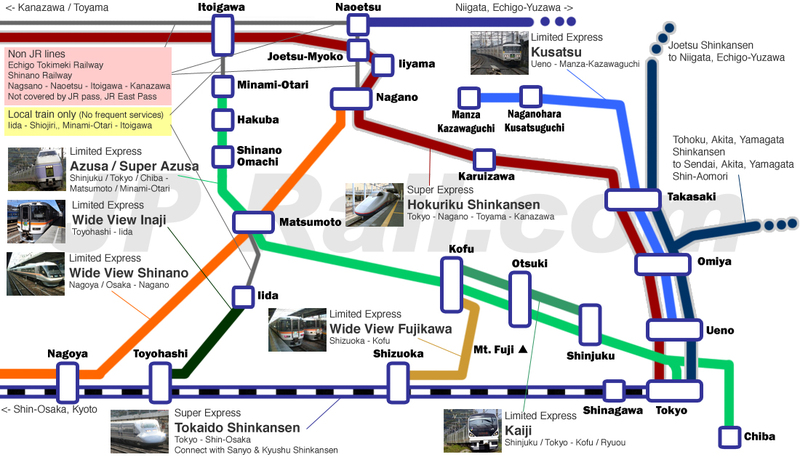 In this post, I summarize train access information to Shinshu and surrounding areas. You can find the information about access to Shinshu region from Tokyo, Nagoya, Osaka, Kanazawa and Toyama. As you see the map above, Tokyo, Shinjuku and Ueno are gateway stations from east side. Nagoya is a primary gateway station from west side. Naoetsu and Itoigawa are gateway stations from north side. Let’s see how to access to major cities in Shinshu region. You can catch the direct transfer from Tokyo and Nagoya. Hokuriku Shinkansen (previously called Nagono Shinkansen) can take you directly from Tokyo. Average travel time is 1 hours 45 minutes. If you travel from other than Tokyo, transfer to Hokuriku Shinkansen at the following stations. Omiya – Sendai Fukushima, Akita, Yamagata, Aomori and most cities in Tohoku and Hokkaido area. Tohoku Shinkansen to Omiya and transfer to Hokuriku Shinkansen. Tokyo – All cities between Tokyo and Shizuoka. Take Tokaido Shinkansen to Tokyo and transfer to Hokuriku Shinkansen. Hamamatsu is closer to Nagoya than Tokyo. But if you can catch Hikari to Tokyo, Tokyo transfer route is sometimes faster than Nagoya transfer route. Takasaki – Niigata, Nagaoka and most cities along west cost of Tohoku region. Take Joetsu Shinkansen to Takasaki and transfer to Hokuriku Shinkansen. 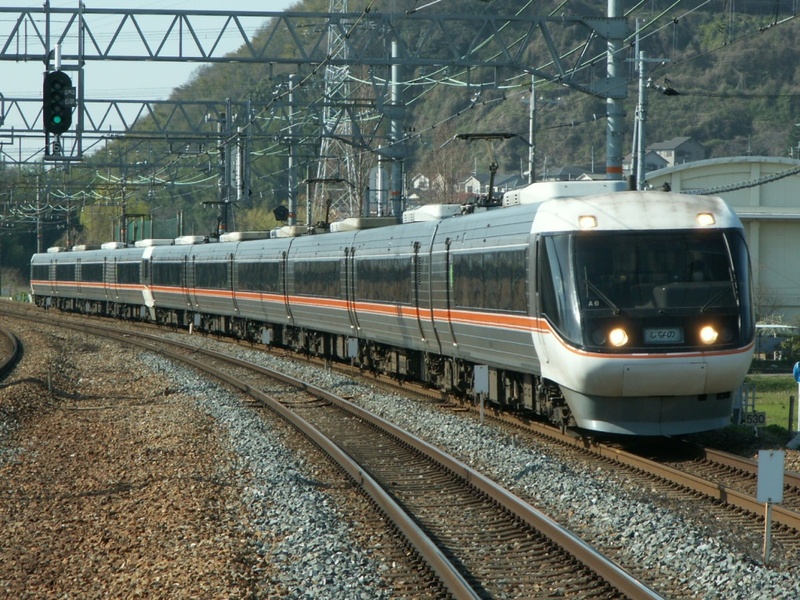 Technically you can take Niigata – Naoetsu – Nagano route. But since Hokuriku Shinkansen opened, the segment between Naoetsu and Nagano is not JR line any more. You can take non JR local train to Joetsu-Myoko and transfer to Nagano Shinkansen. But trip distance of this route is shorter but travel time is longer. So don’t try to take this route unless you are very familiar to JR train system. Please see the post, Hokuriku Shinkansen, direct access to Kanazawa, Nagano and Toyama from Tokyo to get the details about Hokuriku Shinkansen. 13 round trips a day of Limited Express Shinano are operated. Limited Express Wide View Shinano connects Nagoya with Nagano. So get on Shinkansen to get Nagoya and transfer to this train, Wide View Shinano. Travel time is about 3 hours to get Nagano from Nagoya. There is only one round trip between Osaka and Nagano. As of March 2015, Shinano #9 depart from Osaka at 08:57 and arrive at Nagano at 13:53. And Shinano #16 depart from Nagano at 14:04 to Osaka and arrive at Osaka 19:18. If you can take this train, you don’t need to transfer at Nagoya. But remember Shinkansen is much faster. It takes 1 hour from Nagoya to Shin-Osaka. It takes about 2 hours by Shinano. Even though you spend at least 10 minutes to transfer at Nagoya, taking Shinkansen is faster than direct transfer by Shinano. Please see the post, Access to Nagano from Nagoya and Osaka. Limited Express Shinano to get the details. It was very inconvenient to take this route before Hokuriku Shinkansen opened. But now Hokuriku Shinkansen connects Kanazawa, Toyama and Nagano directly. 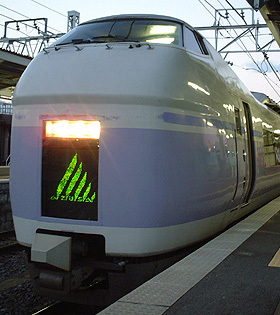 The fastest train, “Kagayaki” on Hokuriku Shinkansen connects Kanazawa and Nagano in 1 hour 10 minutes. Karuizawa is one of most popular highland resort in Japan. If you access to Karuizawa from Tokyo, it is same way as access to Nagano by Nagano Shinkansen. If you access from Nagoya or to the west from Nagoya, don’t take Wide View Shinano from Nagoya. Simply getting on Tokaido Shinkansen to Tokyo and transfer to Hokuriku Shinkansen. This is faster than Shinano and transfer to Hokuriku Shinkansen at Nagano. If you access from Kanazawa or Toyama, just hop in Hokuriku Shinkansen. Trip time is around 2 hours. By the way, do you know Karuizawa is very close to Kusatsu. If you take a train. it is a big detour. But if you take a bus, it takes 1 hour 10 minutes. This is not covered by any rail pass. But you may consider this route if you want to go to both Kusatsu Onsen and Karuizawa. You can get the timetable and fare table here. You can access from both Nagoya and Shijuku / Tokyo. Technically you can access from Kanazawa and Toyama via Itoigawa. The easiest way is using Limited Express Azusa or Limited Exspress Super Azusa. It connects Shinjuku with Matsumoto directly. Average travel time is about 3 hours to Matsumoto from Shinjuku and 2 hours 20 minutes to get Kami-Suwa (Lake Suwa) from Shinjuku. Some of the trains can be caught at Tokyo and Chiba. Shinjuku can be accessed by local train from Tokyo and Chiba easily anyway. Please read the post, Train to Matsumoto, Kofu and Hakuba from Shinjuku, Limited Express Azusa, Super Azusa and Kaiji to get the details. If you go to Matsumoro from Tokyo (not Shinjuku), sometimes Hokuriku Shinkansen and Limited Express Shinano combination is faster than Azusa / Super Azusa. Get on Hokuriku Shinkansen to Nagano and you can transfer to Limited Express Wide View Shinano at Nagano station. You have to transfer but it is faster. Especially if you leave from Tokyo, you may have to take local train to Shinjuku. You will spend 13 minutes and you have to spend some more minutes for transfer at Shinjuku. Compare both travel time when you make a plan. But don’t take this way to get Kami-Suwa or other places on the way to Matsumoto. In this case, Azusa / Super Azusa is faster. 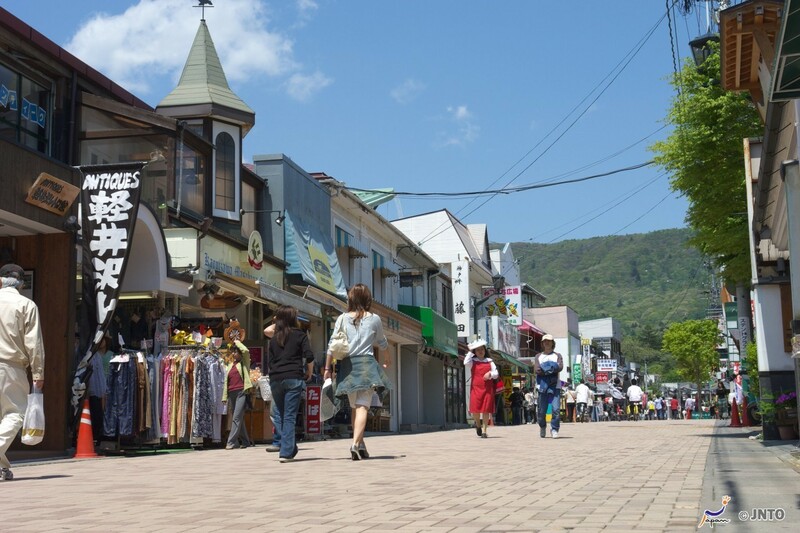 If you access to Matsumoto from outside of Tokyo, just access to Shinjuku by Shonan Shijuku line from Yokohama, by Tohoku / Akita / Yamagata / Joetsu Shinkansen from Sendai, Morioka, Akita, Yamagata, Niigata and Shin-Aomori to get Tokyo. Limited Express Wide View Shinano to Nagano makes a stop at Matsumoto. So it is same way to get Nagano. Please see the above chapter. Suwa from Toyohashi, don’t take this route. There are only two round trips of Limited Express Inaji and you will spend many minutes from Iida to Matsumoto by local train. This route is not very convenient. If you access from Kanazawa or Toyama, you can take both Itoigawa-Matsumoto or Naoetsu-Nagano-Matsumoto. I mentioned above, there is only local train between Naoetsu and Nagano. It is same thing between Itoigawa and Minami-Otari. This section is much more inconvenient for tourists. There are only 7 round trips a day. And also there is only one round trip of Limited Express train between Minami-Otari and Matsumoto too. If you get a good connection at Itoigawa and Minami-Otari, this route is the fastest. But usually Naoetsu-Nagano-Matsumoto route is a primary. If you leave from Kanazawa, you can check Kanazawa-Nagoya-Matumoto route too. You can take Limited Express Shirasagi from Kanazawa to Nagoya. And then transfer to Limited Express Wide View Shinano. It looks a big detour. But sometimes this route is the fastest. These areas are located along Oito line between Matsumoto and Itoigawa. Train services are not very frequent. It is same way to get Matsumoto. And Limited Express Azusa takes you these station directly. But there is only one round trip to Minami-Otari via Hakuba and Shinano-Omachi. Mostly you have to transfer at Matsumoto. There is no scheduled express train other than Azusa. If you travel on weekend, you can take Rapid Resort View Furusato. It is more frequent the section between Itoigawa and Minami-Otari. But there is only local train. 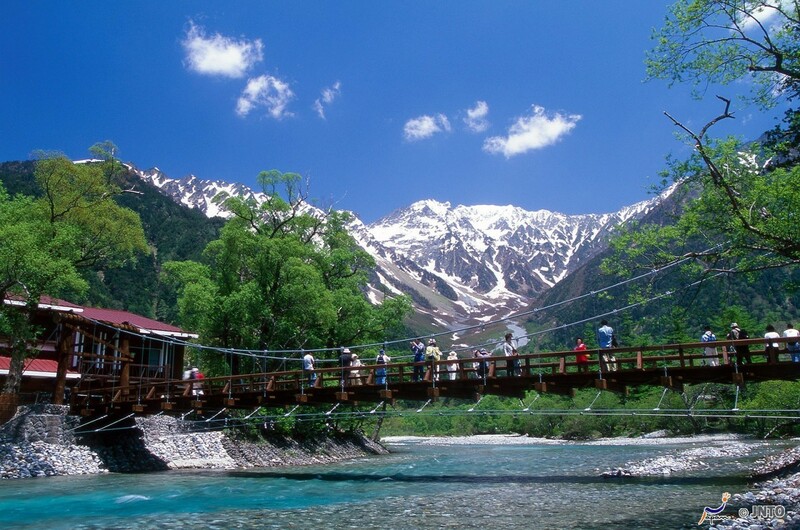 Travel time is 1 hour to get Shinano-Omachi from Matsumoto and 1.5 hours to get Hakuba. Please check the timetable before going to these stations. It is same way as access to Matsumoto. Once you get Matsumoto, transfer to local train on Oito line. Please use hyperdia to check other local trains’ timetable. I would like to ask if there is a regular (non-shinkansen) train from Hiroshima station to Nagoya or direct to Nagano? Because my sister lives in Hiroshima and I will stay there and I want to visit Nagano, but shinkansen is too expensive for me, so I just want to take a non-shinkansen train. May I also know the name for that, please? Also, if there is may I know the name of the station/stations? Thank you so much. If you take regular trains, you will spend about 12 hours and need to change trains more than 10 times from Hiroshima to Nagano. Even if you go to just Nagoya, you still need to spend 8 hours and need to change trains 6 or 7 times. Because most of trains are commuters train. There is no direct trains. Oh, 6 or 7 times would be such a hassle. Thank you so much, Takeshi-san. I guess I’ll just take the shinkansen also to avoid being lost. Thank you so much, this is a great help. I also thank you for sparing your time. I have another question. If I go there by shinkansen, is there a shinkansen station in Hiroshima that goes directly to Nagano or will I have a stop-over in Tokyo or Nagoya? Also, I want to ask if you have a website in which we can access the fare costs for shinkansen? May I also ask what are the name’s of the stations (only if you have spare time), because my sister is not quite familiar outside Hiroshima. 😀 I’m still preparing for my destinations and which route I will take because I will go there by myself 😀 but I will be staying in Hiroshima with my sister, that’s why it’s quite far. Thank you so much. You need to change trains at Nagoya. You cannot get Nagono from Hiroshima without any changing trains. Actually one way trip fare is around 18,000 yen. JR Pass 7 days is cheaper than regular fare. Even if you use JR Pass for round trip to Nagano from Hiroshima only, you still can get the worth. If you want to know the exact fare, please use hyperdia to find it. Can we are use our 7 days JR pass to go from Nagano station to Hakuba station. At the same time we would like to stop over at Matsumoto for a 1/2 day walkabout. We are travelling around mid December 2017. Of course you can. 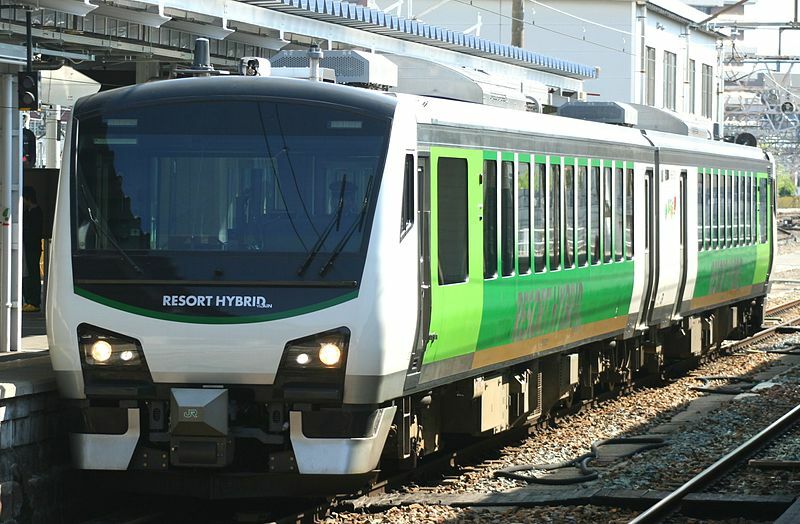 You can take either limited express Shinano or local train from Nagano to Matsumoto. And you can take a local train to Hakuba from Matsumoto. Previous Previous post: How to access to Takayama by trains and buses.